Govenor Doyle chatted during the dedication program with students from Lakeshore Technical College's Wind Energy Technican program. At the first wind project dedication ceremony for a major wind project in the state of Wisconsin in over seven years, Governor Jim Doyle (D) and other state government officials dedicated the Forward Wind Center in Brownsville, WI. 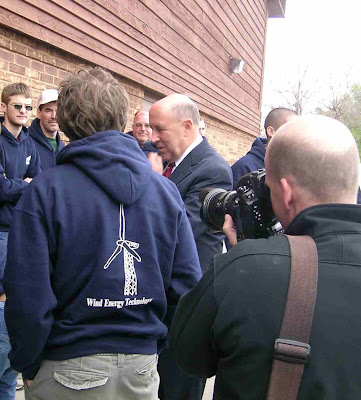 Governor Doyle gave remarks at the ceremony on Wednesday, October 22, 2008 at the Brownville Community Center, noting that “the project represents a clean energy milestone for Wisconsin, meaning greater energy security, better wages in green jobs, and clean air and water for generations to come”. He also emphasized that in the economic turbulence “clean energy future greater investment, more jobs, and more security at home”. A global warming task force commissioned by Governor Doyle issued a report in August recommending that Wisconsin accelerate its Renewable Energy Standard targets, achieving 10% by 2013, 20% by 2020 and 25% by 2025. Governor Doyle also reiterated his intent to pass the enhanced RES in the 2009 legislative session to require state utilities to get 25% of their electricity from renewable energy such as the energy produced by the Forward Wind Center by the year 2015. He also called for the great manufacturing capabilities in Wisconsin to be directed towards clean energy technologies such as wind power as well. Michael Polsky, President and CEO of Invenergy, welcomed an over-flowing crowd to the project dedication ceremony and described the benefits of wind power, saying “It just makes sense” from so many different perspectives, including energy security, long-term clean energy production, and environmental benefits. Tours were conducted throughout the afternoon by developer Invenergy, the project owner and operator. The output of the project is under contract to four Wisconsin utilizes: Madison Gas & Electric, Wisconsin Public Service, Wisconsin Power & Light (Alliant Energy), and Wisconsin Public Power, Inc. The Forward Wind Center consists of 86 General Electric 1.5 MW wind turbines (for a total of 129 MW) covering 12,000 acres in Dodge and Fond du Lac counties in Southeastern Wisconsin. Commercial operations at the facility began in March 2008, the project is expected to produce enough energy to power 30,000 homes and avoid the burning of 187 million pounds of coal per year. The Forward wind project is one of four major wind projects schedule to come on-line in 2008, representing a major step forward for the state of Wisconsin. More from an article by Aubrey Fleischer in The Reporter (Fond du Lac).